Way back in 2002, I began a journey which changed my whole life. 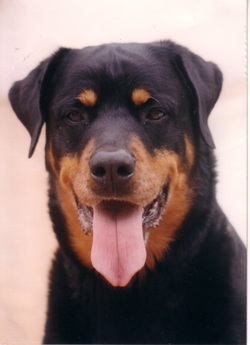 I had a beautiful, though rather aggressive Rottwieler who had developed in-operable spurs on his spine, and not liking the strong pain medication he was on, I started to look for an alternative to help him in his golden years. A friend suggested a new modality to South Africa, called Tellington TTouch, which was reputed to help with physical and behaviour problems. So, not knowing any more about the modality I took him along on a one-day workshop to see if it would help. I was in a lot of trepidation about this, as Zeus was a 58kg dog, hated other dogs and being on the small side myself, I was rather concerned about the outcome-needless to say, we sat well away from the other participants!. I was told that the TTouch would also help with his reaction to other dogs, but I was rather sceptical about that side of things. I was shown how to do various TTouches and exercises which would help him and I religiously started doing these touches on him on a daily basis and within a week there was a definite improvement and I started to reduce the medication. Shortly after this I took him out for a walk and suddenly realized that he was not reacting to other dogs in such a severe manner, his behaviour towards them had definitely changed for the better. This proved to be a turning point in my life, the more I worked on my own dog and friends dogs, the more improvements I saw happening, both on a physical and behavioural level. I was becoming (and still am) an obsessive ‘TToucher’ working on every animal I could get my hands on. I signed up for the 3 year practitioner course, and took my passion for animals a step further. TTouch was ‘birthed’ by horse expert Linda Tellington Jones in 1975, after attending a course by Moshe Feldenkruis, Ph.D., who was the developer of a mind-body system integration to assist with alleviating pain and improve neurological dysfunction in humans. Being a ‘horse’ person, Linda began applying the techniques she had learnt with horses. The results were excellent as she developed the Tellington-Touch Equine Awareness Method, which is know as TTeam for short. She soon started teaching others who wanted to improve their horse’s performances. Linda noticed that the behaviour of the horse was affected as well, and she began applying the technique to dogs, cats and other animals with the aim of helping animals with behaviour problems using the totally non-invasive methods she had developed which are based on co-operation with the animal. The results were spectacular and led Linda to develop TTouch for companion animals. The touches are the foundation of the TTouch method and are made up of different circular movements of the fingers and hand on the skin, as well as using slides and lifts. These touches are non-habitual movements and serve to activate new neurological pathways to the brain. Linda Tellington Jones says ‘TTouch works on both body and brain in a specific manner – the body becomes relaxed at the same time as the mind’s ability to learn and to master new tasks is enhanced. Along with an increased potential for learning, the desire to learn is also awakened” Many of the touches could be likened to massage, the difference being that the results are accumulative. TTouch also utilizes a second technique, know as Groundwork or The Playground of Higher Learning. This involves guiding the animal through movement exercises, often using different equipment to do so, in non-habitual ways. During my training, I worked with every animal I could get my hands on and was amazed with the results. One particular case comes to mind of a Marmoset Monkey at a sanctuary who was in intensive care as it was self-mutilating due to stress, and had pulled all its hair out. Not having my own equipment with me, I used two pens (one to distract the monkey and the other to work with) and started doing soft strokes and touches on all the areas I could reach. This was rather difficult as the monkey was in a small cage and the only contact it had had with humans was stress related. After a few minutes, the monkey started turning its body in different positions for me to work on. Some weeks later I returned to the monkey sanctuary and asked Wendy, the owner, if any changes had occurred in the monkey. I was absolutely amazed to find out that it had stopped self-mutilating the same day! TTouch is very easy to learn and brings quick rewards. Not only can you help your own animal by improving the physical and behaviour aspects, it also builds up the communication and trust between you and your pet and most importantly, animals absolutely love it! In closing, I thank my beloved Zeus, who has now passed over, for leading me to this amazing modality which changed not just my own life, but the lives of so many owners and their pets worldwide. TTouch is not just for animals who have any health or behavioural problems, it deepens the bond between you and your animal. Instead of just giving your animal the usual ‘pat’, you can now give attention knowing that you are imparting so much more! Where dogs are used in different modalities such as obedience work and agility, the Touch work will benefit them greatly as well. In fact, TTouch helps with just about any issue or problem you may with your dog.